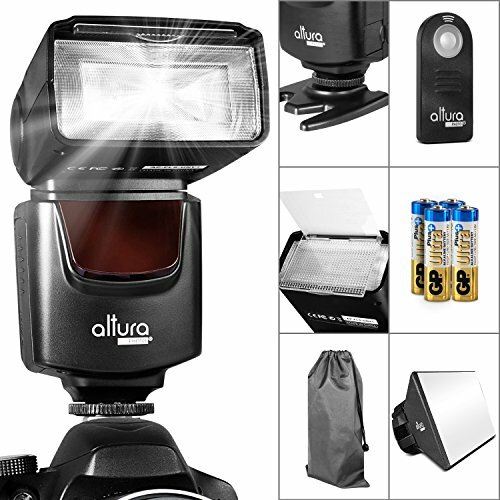 7 item Kit includes Altura Photo Flash (AP-UNV1) + Flash Stand, Softbox Flash Diffuser + Protective Drawstring Pouch + Universal Wireless Remote Control + 4x AA batteries + MagicFiber Microfiber Cleaning Cloth. Features a built-in flip down wide angle flash diffuser and reflection panel. Compatible with NIKON FM FE FA EM FG F4 F5 F6 N8008 N4004 N50 N70 P6000 P7000 P7100 P7700 P7800 COOLPIX A D90 D3000 D3100 D3200 D3300 D5000 D5100 D5200 D5300 D7000 D7100 D200 D300 D600 D610 D700 D750 D800 CANON AE-1 A-1 F-1 T50 T60 T70 T80 T90 EOS Rebel T2i T3 T3i T4i T5 T5i SL1 20D 30D 40D 50D 60D 70D 7D 5D 5D mark II & III 6D 7D mark II 1D POWERSHOT G SERIES PENTAX K1000 K KX K50 ME MG LX P30 P50 Panasonic LX7 GF1 and all cameras with a standard hot shoe mount. Backed with DigitalGoja 90-Day 100% Satisfaction Guarantee. If you're not happy with your flash for any reason, please contact us and we will take the product back for a full refund. – Pack of 4 Batteries included. Size: AA.